Delta Kappa Epsilon is one of the oldest fraternities with 52 active chapters in the United States and Canada. It was founded at Yale College in 1844. The fraternity has produced five presidents of the United States, has had its flag flown at the North Pole and on a landing on the moon. The fraternity is privileged with having founded a fraternity that has brothers who have served in top government positions along with legislation and judicial services. Make your graduation very memorable with high quality custom designed sashes. 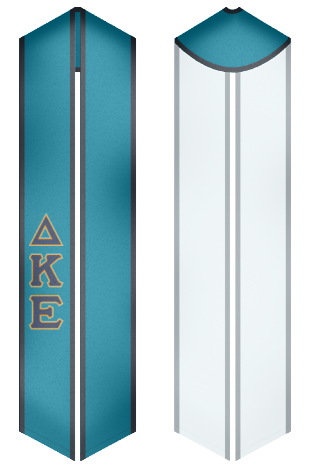 Wear the sash and make your day more memorable and show everyone that you are proud of your fraternity.